Motherwell Cheshire CIO has launched its Women’s Cycle Ride. 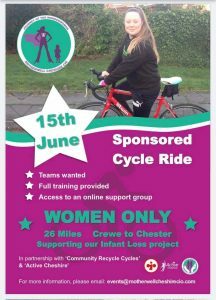 The Active Cheshire sponsored cycle is for all abilities and will take place on Saturday 15th June. People have the choice of starting in either Crewe or Winsford, with both groups ending in Chester. Full training is provided and people will be able to access an online support group. They are working with Community Recycle Cycles, should anyone wish to take part who does not own a bike.